Garden strawberries are a common variety of strawberry cultivated worldwide. Technically, it is not a Fruit but a False Fruit, meaning the Fleshy part is derived not From the plant ovaries but From the peg at the bottom of the bowl – shaped hypanthium that holds the ovaries. The garden strawberry was First bred in Europe in the early 18th century. Presently, most strawberries are Fertilized by artificial Fertilizers, but in the past, Farmers would gently scrub each strawberry with maure, Followed by another 1-2 weeks of natural Fertilization outdoors. After being Fertilized outdoors, the cleaning process, which has not changed significantly through time, commences with the 6-8 million strawberries (70-90 million today) placed on a shaking conveyor belt while streams of water clean the strawberries. After travelling through another 5 series of cleaning cycles, the strawberries are once again rinsed and divided into varying sizes of plastic containers to be delivered to vendors. In addition to being consumed Fresh, strawberries can be Frozen, made into preserves as ell as dried and used in such things as cereal bars. 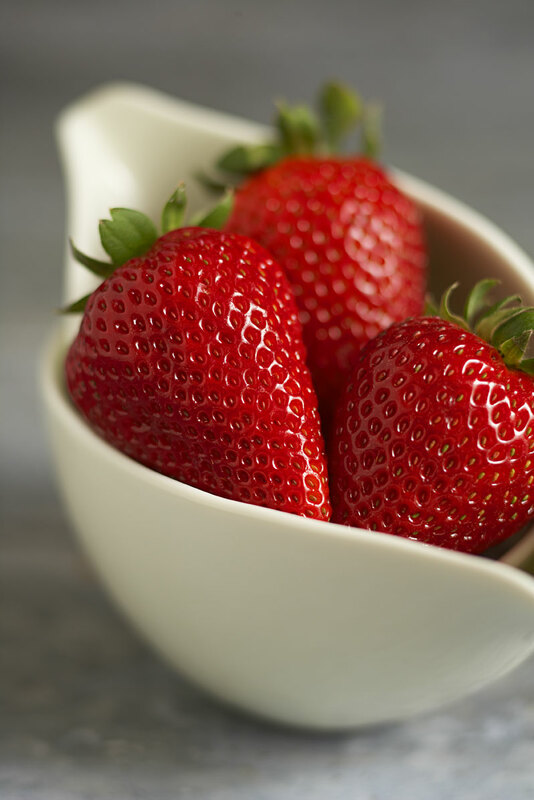 Strawberries are a popular addition to dairy products as in strawberry Flavoured ice cream, milkshakes, smoothies and yogurts. Strawberry pie is also popular. Cosmetically, they are supposedly used For whitening teeth. They can be crushed and made into an exfoliant For skin. Strawberry pigment extract can be used as natural acid/base indicator due to the different colour of the conjugate acid and conjugate base of the pigment. One cup (144 g) of strawberries constitutes approximately 45 calories (188 Kj) and is an excellent source of vitamin C and Flavonoids.